Offering you a complete choice of products which include jumbo crates, rectangular jumbo crates, fabricated jumbo crates, gtp-654315 blue jumbo crates and mini jumbo crates. We offer a wide range of Mini Jumbo, Jumbo & Super Jumbo crates which are used in automobile, fisheries, Food processing plants. These crates are heavy duty and hence have a longer shelf life. We are offering a wide range of Rectangular Jumbo Crates. We are offering a wide range of Fabricated Jumbo Crates. 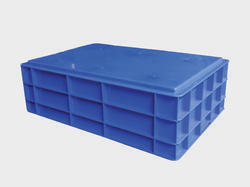 We are offering a wide range of GTP-654315 Blue Jumbo Crates. We are manufacturer and seller of Mini Jumbo Crates for our customers with good customer satisfaction and product quality.